Recently, my editor lamented the challenge of collecting music when we find and listen to it from so many different sources. Without a one-size-fits-all solution, we end up forgetting some of the music we’ve stumbled upon across services. Other times, we come across something we don’t have time to listen to, but want to check out later. Again, without a solid collection option, the song disappears into digital oblivion. 5) If you’re a do-it-yourself type person, you might want to consider creating your own “Listen Later” blog. We found this step-by-step guide to building a music collection blog using Tumblr and a Firefox add-on. 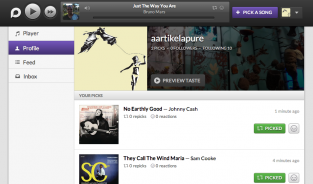 Customizable blog features let you avoid having a cookie-cutter music collection. Tumblr and Firefox are both optional, but if you go with another browser, you’ll need to stick with streaming or else find your own “download helper” for the browser of your choice, for leeching the tracks you like back off of your blog. 6) Then, there’s a mobile-only option, which is as-yet unreleased, so you might have to “collect” the URL in your calendar. Stash.fm, created at Music Hack Day @ MIT last November, will bring music collection across multiple sources to Android and iOS when it is released in about four months. Using the Rdio API for playback, the app will support an impressive list of sources — Spotify, SoundCloud, YouTube, Songza, Hype Machine, Shazam, and Google Play. We haven’t seen another mobile option like this, so it sounds like it’ll be worth the wait.